The state of Hildago is located in central Mexico. One of the smallest states in the country, its territory covers approximately 8,036 square miles. The state was named in honor of Miguel Hidalgo y Costilla, the chief leader of Mexico's War of Independence against Spain. The state is bordered in the north by San Luis Potosi and Veracruz, in the east by Puebla, in the south by Mexico and Tlaxcala, and in the west by Queretaro. The capital of the state, Pachuca, is located high in the mountains of the Sierra Madre Oriental at approximately 8,000 ft. This area of Mexico is known for its vast quantities of silver and gold as well as obsidian, a stone that was highly prized by the indigenous peoples and widely traded. 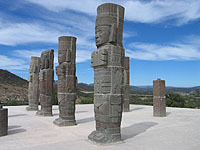 Pachua is only 58 miles from Mexico City. Just outside the city is the wonderful El Chico Park. This lovely spot, high in the mountains, offers outdoor activities such as rock-climbing, mountain biking and hiking trails. The rock formations are stunning and the air is fresh and invigorating. Northwest of Pachua are several small historic towns worth noting. Actopan, features an Augustinian priory with elaborate murals showcasing biblical scenes. Built in the 16th century, exquisite frescoes decorate the walls. The city of Ixmiquilpan is home to a huge ex-monastery called St. Michael the Archangel. Built in 1550, this building houses unique Indian frescoes. You'll notice as you travel through the countryside a plant that is quite prevalent here, the maguey. Open-air markets feature many products made from this plant including pulque, aguamiel and mezcal. Should you be in this region at the start of November, the nearby city of Huejutla has a splendid Dia de Los Muertos (Day of the Dead) celebration. Special foods are prepared and petals from marigolds line pathways from the homes of families to the grave sites of their departed ones. For the inhabitants of Huejutla it is a time to remember and honor those who have crossed over. Common belief holds that the deceased can visit the living during this time of year. Another great town in the area to visit is Tasquillo. Many come here to swim in the natural warm mineral pools. Many come to Hildago to visit the famous Tula Ruins, the ancient ceremonial city of the Toltecs. The time period in which this city flourished was between 950 and 1150 A.D. Known as Tollan to its original inhabitants, the city is said to have been quite magnificent, with palaces made of gold and turquoise, accented with jade. Tula was looted by the Aztecs and very little remains today of the original city. The ruins that remain, however, are quite striking and do share a few secrets of the city's ancient past. Atop the ruins' principal attraction, which is known as The Pyramid of the Morning Star, sits the Atlantes, four massive stone warriors that stand 15 feet high. The site also has a ball court that is in remarkably good condition. One statue called "The Chacmool" is a carving of a priest who holds a bowl to his chest. It is believed human hearts were placed in this receptacle as an offering to the gods.